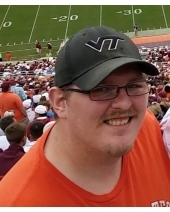 Robert Earl Davis V, 28, of Roanoke departed this life early to be with the Lord on Monday, November 12, 2018. Robert was a graduate of Patrick Henry High School, Class of 2008. He was preceded in death by his wife, Tiffany A. King; and by his grandmothers, Bonnie Marie Davis and Earsie Craighead Proctor. Surviving are his mother, Kimberly L. Freels (Christopher); his father, Robert Earl Davis IV (Sharon); his grandparents, Robert and Edie Davis III and Calvin Proctor Sr; his sister, Victoria Payne (Rebel); his brother, Joseph Davis (Big Bear); his step brothers, Travis Oyler ( Stephanie), Timothy Freels and Zachary Freels; his Nieces and nephews, Tytus and Merlin Payne, Lacie and Hixon Oyler; and many aunts, uncles and cousins. A celebration of Robert’s life will be conducted at 11 a.m. on Saturday, November 17, 2018 at Lotz Funeral Home, 1001 Franklin Road, Roanoke with Pastor Jeff Gardner officiating. The family will receive friends Friday, November 16, 2018 from 6-8 p.m.